DISCONTINUED. The CD25X boiler is an entry level Combination boiler designed and manufactured by the heating company Alpha. However this does not mean a huge drop in standards as the CD25X boiler is built to the same high standards found in all of Alpha's boilers using stainless steel and top quality components. This allows the CD25X to attain the same excellent levels of performance and reliability achieved in products across the entire Alpha range. It is also worth noting in these times of energy efficiency that the CD25X is SEDBUK2009 Band 'B' rated and is endorsed by the Energy Saving Trust. 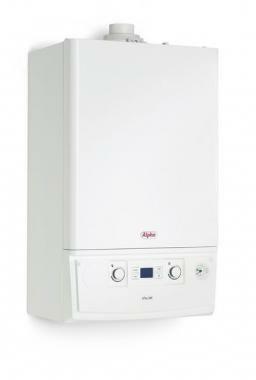 The CD25X is also characteristic of the rest of the Alpha ranges by having a straightforward and easy layout to the actual boiler meaning future maintenance and operation of the boiler is made as easy as possible. It is also designed to fit into a stylish and compact casing which is in fact fully compatible with the Alpha Premier Pack jig. The Cyclone protection facility on the Premier Pack actually extends the warranty by a further two years making it a worthwhile purchase for more than just the obvious reasons.